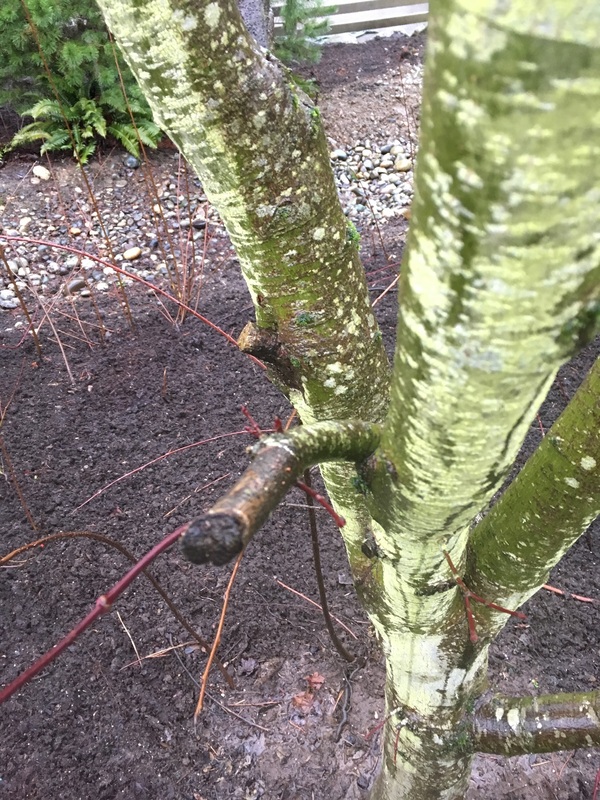 February 2018 - Proper Landscaping Inc.
I’m kidding, of course, I don’t suffer from rashes after tree pruning. But I do find pollarding too forced and ugly immediately after. In summer, when the tree crowns are full of foliage the trees look fine. 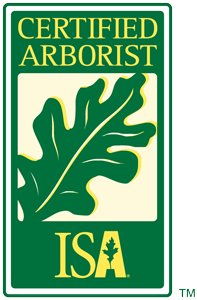 Incredibly, I’ve been an ISA certified arborist since 2006 but last week was my first-ever pollarding session. Since our site was all snowy, it was a great time to prune trees. So why do we resort to pollarding? In the very old days, people understood that cutting down all of their trees for firewood was short-sighted. So instead they pollarded their trees and then used the wood. But times have changed. Now we pollard trees to keep them at a smaller size then they would otherwise reach. It makes sense at our site where three London plane trees (Platanus x acerifolia) are located close to the pool. See the picture below taken from my Kindle e-book: Common Strata Plants: A Guide for West Coast Landscapers, available for download from Amazon. 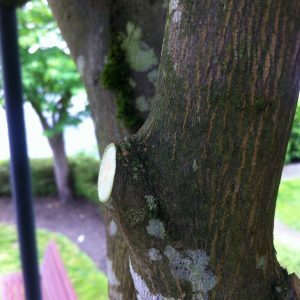 Pollarding involves the removal of the upper branches of a tree which then promotes a dense head of foliage and branches. It just looks like hell right after you do it. In a perfect world, the London plane trees could be let go to grow as big as they wished. I wish! The trick, then, is to pick a height and pollard the trees annually. The actual work is very simple because you’re simply beheading skinny branches that shot up from the previous pruning cuts. Staying safe while you prune is more demanding. My arborist technician apprentice climbed the tree while I stayed on the ground and used a ladder with pole pruners. Once in a while I would steal a big-brother glance at my eager apprentice to make sure his ropes were still supporting him. My work in progress. The gnarly ends of the branches don’t exactly inspire me. Late winter or early spring are best for pollarding. One exception are maple (Acer species) which bleed sap when cut at these times. 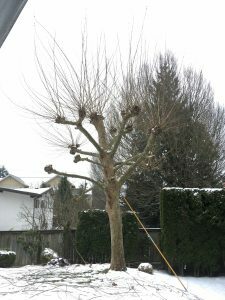 The pruning rule for maples is before Christmas. 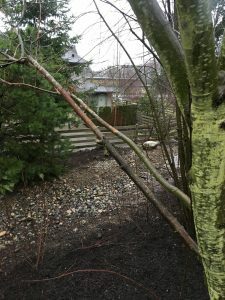 If you have trees that are outgrowing their space and you don’t want to lose them or can’t afford to replace them, then by all means pollard your trees annually. The trees look horrific immediately after pruning but in summer they’re fine. Personally, I would prefer not to pollard anything. 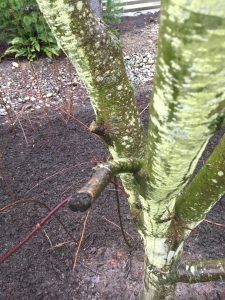 Raising tree crowns by “skirting” is a common pruning job. It basically means removing the lowest branches so the crown above looks raised up. This is usually necessary when cedar trees (Thuja plicata) haven’t been pruned for a while. When you do this kind of work, don’t forget about two common pitfalls. One is not stopping and removing too many branches so that the tree looks like a lollipop. It’s unnatural and should be avoided. 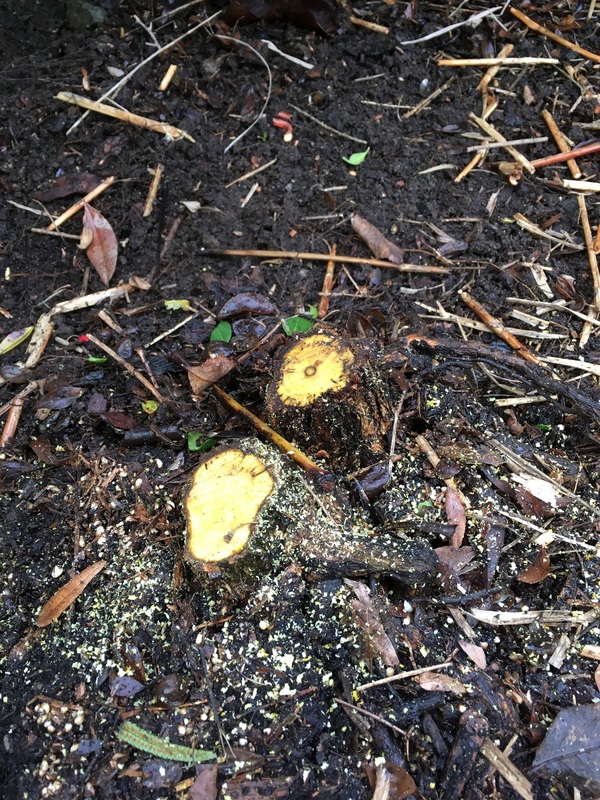 It’s a common problem with other tree species, not just Thuja plicata. So by all means, raise up the tree crown but know when to stop. Two, privacy. Unless you know the site well and your directions are very specific, don’t forget to consider people’s privacy. I wish it wasn’t true but I’ve heard of a gung-ho landscaper who was servicing a new site for the first time. He walked by a double line of Thuja plicata trees separated by a wooden fence. At one corner the trees were especially low so he skirted them right up. Great. 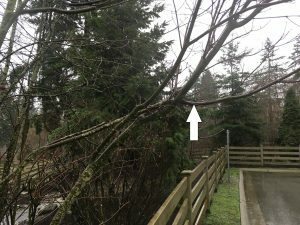 Except the owner of the unit loved every single branch and he was livid. His comments can’t be printed in a clean, family blog like mine. Suffice it to say that he failed to express himself intelligently. But I feel for him a little bit. The tree was fine the way it was and now he has the view of a wooden fence. So when you take over a new site, get to know it well first. Recently we made our way around a large complex that had been neglected for many seasons. I noticed several low-hanging Thuja plicata branches and almost reached for my trusted Japanese hand-saw. Of course, I am a Red Seal professional with many seasons under my belt. My instinct told me that the low-hanging branches were probably providing a privacy screen for the residents. If I had removed the branches they would be looking at a residential tower and its car ramp. So unless I hear otherwise from the strata council, the low hanging branches will stay. Always consider privacy issues. It’s very easy when your clients actually request the crown raising. In these cases it’s just a matter of knowing when to stop. And in this one residential example, the client clearly told me to “rescue” her overwhelmed patio and plants. So I made nice cuts until all Pieris japonica, Rhododendron and Yucca plants were no longer obstructed by the cedar trees. Remember to make three-point cuts where the weight is taken off first and then the cut completed nicely. Cedar branches are heavy. 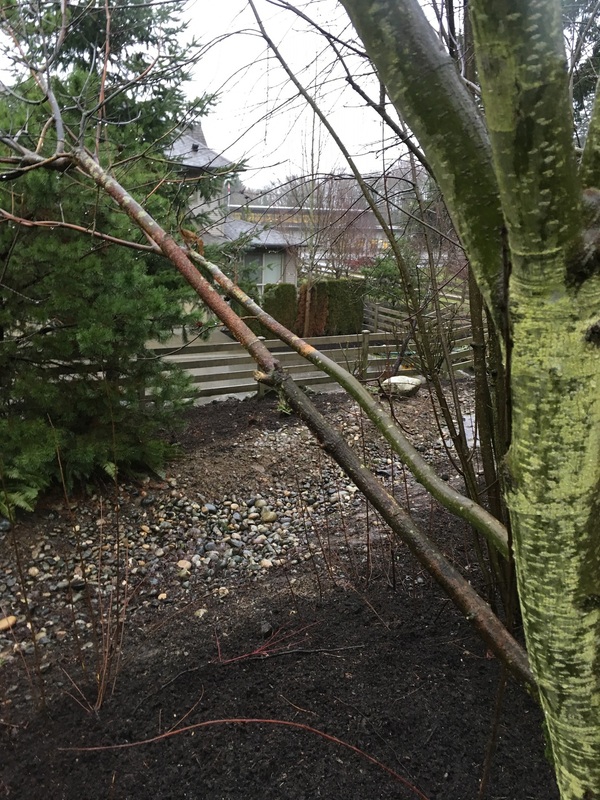 The pruning also solved the same problem for her patio where she entertains guests in summer. She was absolutely thrilled to get some breathing room on her back patio. And happy clients are the best clients. Before pruning, the Pieris and Yucca plants were covered by cedar branches. Not only are the cedar branches off the plants, the patio is also unobstructed. 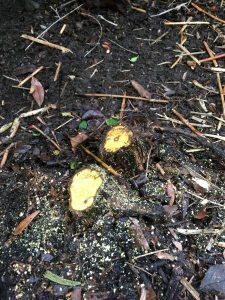 Raising Thuja plicata tree crowns is an easy pruning job but always consider owner privacy issues and know when to stop. 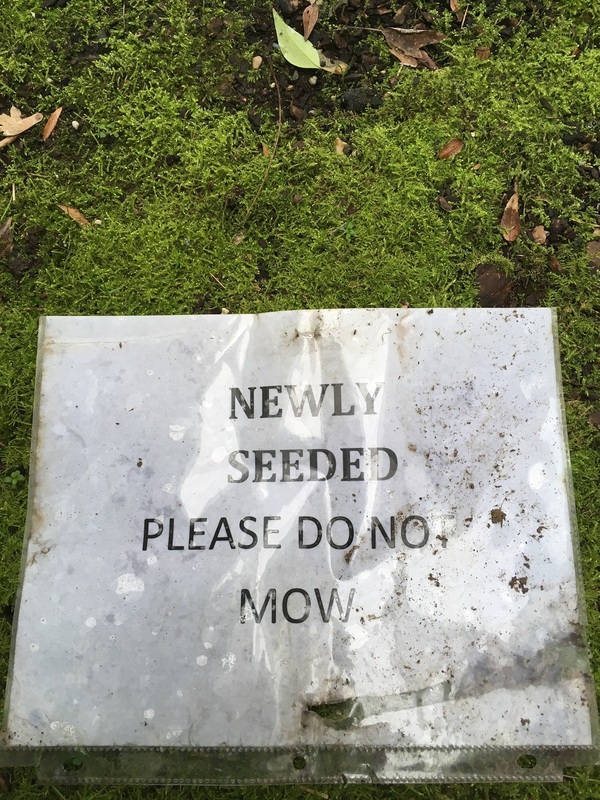 I love people who fight for new lush lawns. I admire their tenacity and envy their deep pockets. But often they get defeated by the site conditions, like available light, good soil and proper seed. This is awesome. I found this sign in between two units on a strata complex we have taken over recently. Now that the key beauty strip areas are cleaned-up, we start hitting the low key zones. Like this space between two units. The sign is full of hope and promise but when you look around, you know it didn’t really work. Why not? 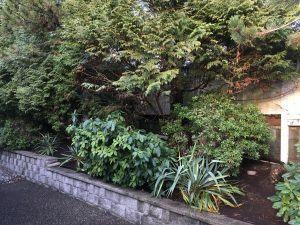 Why can’t strata owners plant some grass seed and enjoy a green buffer zone? Guaranteed, this is the number one problem here. It looks OK in winter but by spring, as the trees flush out with new growth, they add more shade. The buildings do the rest. Plants need light and water for photosynthesis. Pruning the trees would help but it wouldn’t be enough. If you remove too many branches, the tree won’t be able to feed itself. Like grass, trees also struggle to reach light so they can manufacture food. I wonder about the soil depth and quality in a buffer zone like this. In addition, this rectangular patch is a small ecosystem. One idea would be to top-dress the area to help the new shade mix seed. But I am still not convinced that there would be enough light for the grass to thrive. Owners with deep pockets are free to attempt it. Top-dressing is actually a very pleasant landscape job. What’s wrong with moss anyway? It’s prized in Japan. I’ve seen it in beautiful Japanese gardens. I would plant moss and let it go. But people love their lawns. It’s an addiction. Until site conditions cure them. It’s also possible that the vents on both buildings affect the grass. Assuming the vents are from driers and considering that in my own place they get used daily, it could adversely affect the grass seedlings. We don’t even know if the new seed got watered and if the watering took into account the effect of the drier vents. 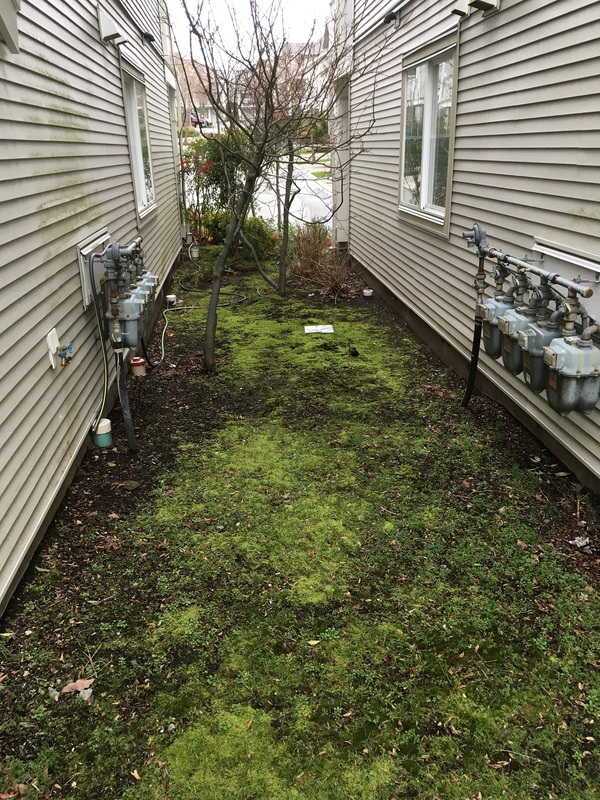 Always consider your site conditions when your lawn struggles. It could be more than just lack of fertilizer. Shade is always a huge issue and the same goes for soil conditions and proper watering. Seek professional advice. 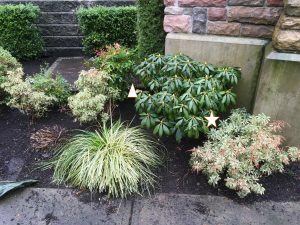 Call Proper Landscaping for professional help. Winter landscape edits: be brave! 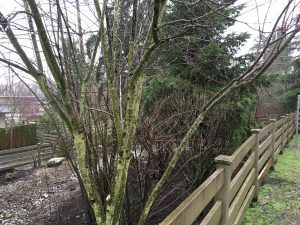 Yes, winter weather can be a challenge for West Coast landscapers but I love winter because I have time to take care of details. Once spring hits, the days get longer and busier and all of a sudden it’s hard to stop for minor adjustments. 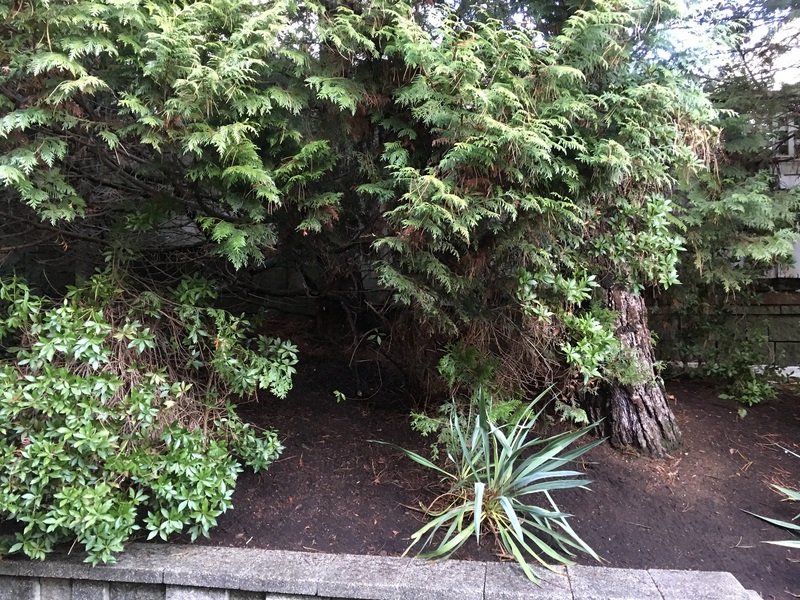 Just this past week as my helper and I were searching for missed corners, I discovered two Rhododendrons under the foliage of Viburnum tinus and Abelia x grandiflora. Now what? 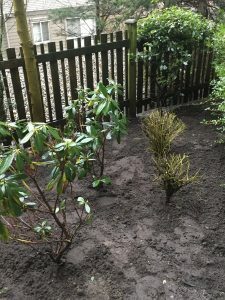 You can prune both shrubs to expose the rhododendrons or you can move the rhodos. I chose to move the Rhododendrons because the shrubs will grow back eventually. So be brave and edit your gardens and landscapes as required. Both Rhododendrons were stuck by the fence in the far right corner. They will have more light in their new location; and we covered up dead space in the landscape. This is the after shot so it looks normal. Where the triangle is now, the back Nandina domestica was squeezed in between the Pieris japonica and the Rhodo. So I moved the heavenly bamboo shrub back a little to create much-needed plant separation. Where the star is now, there were Rhododendron branches covering up the Pieris japonica on the right. So I snipped a few branches off the Rhodendron to create more plant separation. And the Rhododendron still looks normal. This Nandina domestica was very leggy, not the bushy little shrub we want. It was also jammed right against a Japanese holly (Ilex crenata) hedge. We already know that Nandina domestica doesn’t regrow from pruning points. It’s best to flush cut it and let it regrow. So we have a little experiment here. If it regrows, it will match its bushy cousins nearby. And if it doesn’t, well, then the Ilex crenata hedge will thank us. Either way, don’t be afraid to edit your gardens and landscapes. 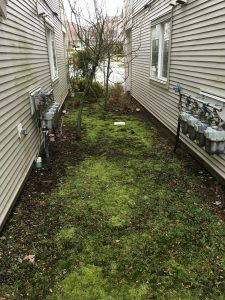 Many strata complexes look great when they are first installed but over time, as plants mature, we can’t forget about plant separation. Often, complete editing is required. We move what we can. Some plants go missing altogether. Have some fun with your landscape editing. 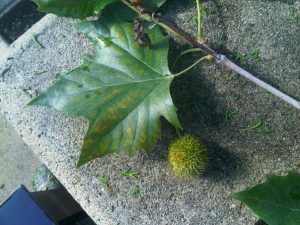 Winter is perfect for checking your deciduous trees. Since the leaves are gone you can clearly see the branches. Ideally, you can do this work annually, making a few cuts each season. This should leave you with healthy, good-looking trees you know well. 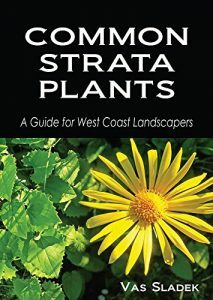 Some strata sites have out-of-the-way semi wild zones that don’t get regular maintenance. Normally the idea is not to discriminate and, instead, attend to all areas equally. But on large complexes that’s not easy to accomplish. So some areas away from the beauty strip get slightly short-changed. This, then, was my mission. Taking advantage of the slower winter season I got to attack one of these wild zones. I will cover the maintenance work in a future blog post. Here I wish to mention a tree I ran into. I removed stubs, dead branches and one crossing and rubbing branch which also reached into the road. These are ugly cuts. Don’t forget to make your cuts at the branch collar so the tree can cover up the wound. Otherwise the stubs eventually die, like the smaller one visible in the back. Much better, no stub, and the tree can heal itself. Dead branches are dead so they are to be eliminated as soon as possible. They will most likely break off anyway. 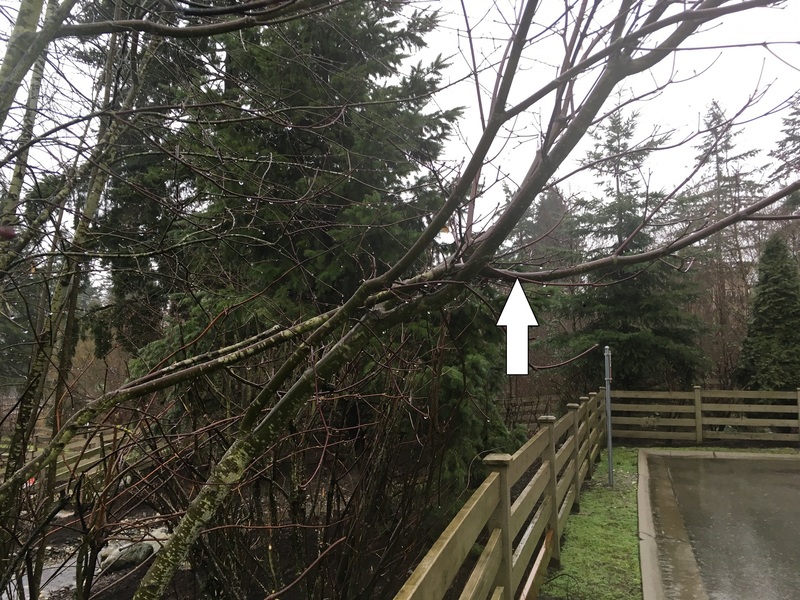 The branch with the pointer is a good candidate for removal because it crosses through other branches where it rubs; and it’s growing into the street where it’s likely to interfere with delivery trucks. This is the final product with ugly stubs removed, dead branches gone and one crossing and rubbing branch that interfered with local traffic eliminated. And it took me a few minutes with my Japanese hand saw. Is the tree perfect? No, far from it but why stress? I will be back in twelve months to do more work on it. And if you need help with your trees, call Proper Landscaping. You can also learn more about tree maintenance from my inexpensive Kindle e-book. Landscape Tree Miantenance by Vas Sladek. Please leave a review.